My name is Pete Moyer, I’m 28 and live in Kansas. I work in healthcare and I am married, but have no children. Ever since I can remember I have been practically obsessed with anything on wheels. I slept with hotwheels instead of teddy bears. Growing up I lived on a farm, so I had the opportunity to ride lots of dirtbikes and fourwheelers. In highschool I got more into hotrods and fast cars. I would fix up a car and sell it for in order to acquire a faster one. I frequently could be found at the local dragstrip racing my cars. I then went off to college and had only time to study. I did tinker around on a CB500 during my summer breaks, but it was a real hack job (and probably not very safe!). After graduation I moved into a house with a tiny garage. My only choice was to work on bikes, often doing so on my back porch. I built several and went a little overboard on the last one (or so my wife says). 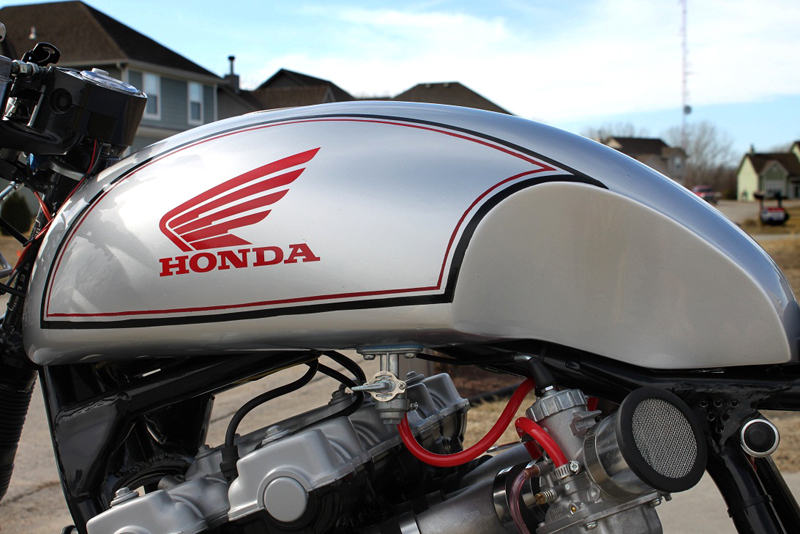 What was the CB750 like when you bought it? I bought this CB750 in boxes from an antique shop in Kansas City, MO. It was on craigslist, the ad simply said “rebuilt 1981 CB750”. It was a good price, so I went to look at it. To my surprise, I found that while most of the parts were rebuilt, the bike was completely disassembled. I love the frame lines of the DOHC CB’s, and I knew I could make a sweet cafe out of it, so I bought it. 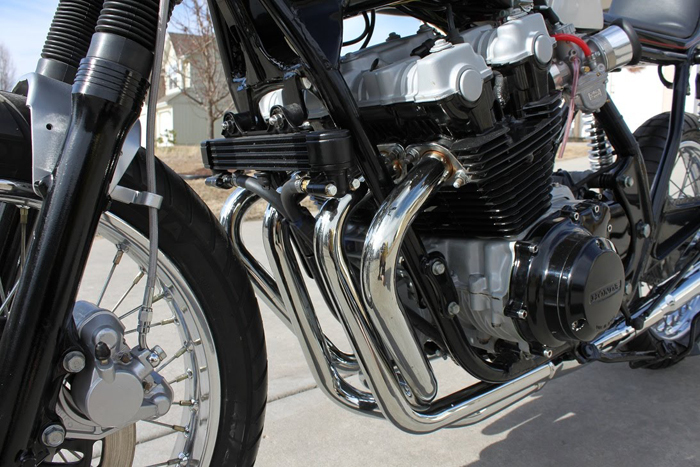 The engine is a CB750 block bored to 890 cc’s with a wiseco big bore kit. It has CB900 camshafts. To keep it cool, it also has the oil cooling system from a CB900F. 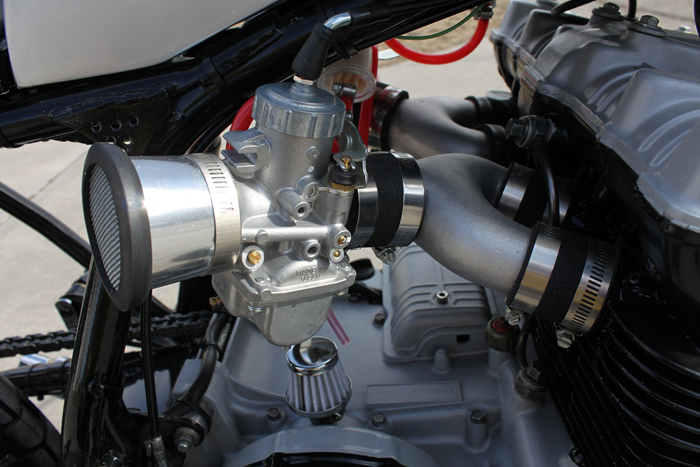 It is fueled by two 34mm mikuni carbs and a custom made intake manifold (courtesy of cyclexchange.net). It has the stock electronic ignition with ngk plugs and wires. 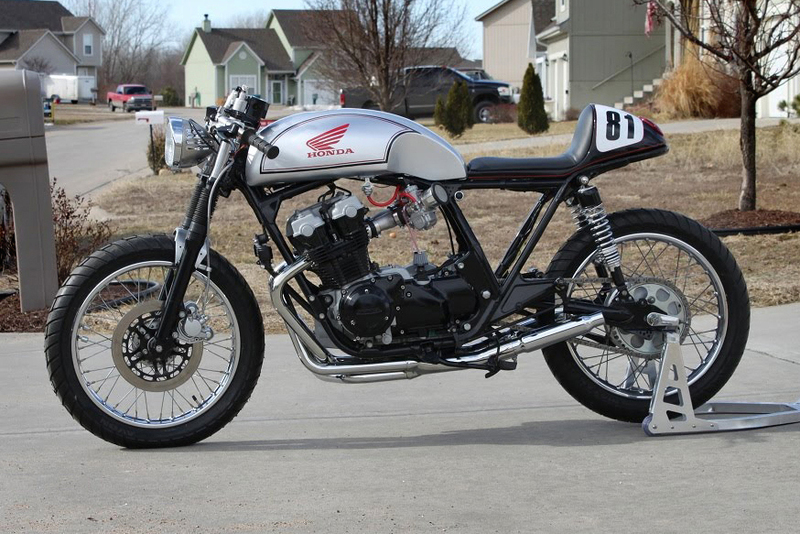 The sweet crossover header came with the bike, but the mufflers were added for a minimalist cafe look. I have them slightly pointed up and out like a moto-gp type exhaust. The tires are Avon Distanzia’s. They are hypermotard tires and have an aggressive tread pattern. I wanted something aggressive, without being knobbies. 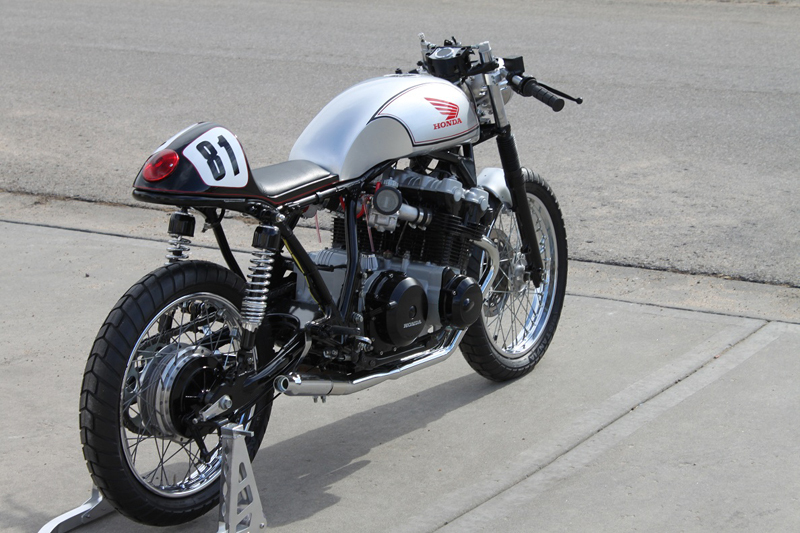 The wheels are stock CB750K wheels. The rear hub was modified to fit a norton commando rear rim that I bought off of ebay. The front forks are from a CB900 They are thicker and more stable than the stock forks. The rear suspension was relocated forward on the rear swingarm to raise the back end approximately 1 inch. The electronics are all hidden under the tail section, including the battery, regulator, fuse block etc. 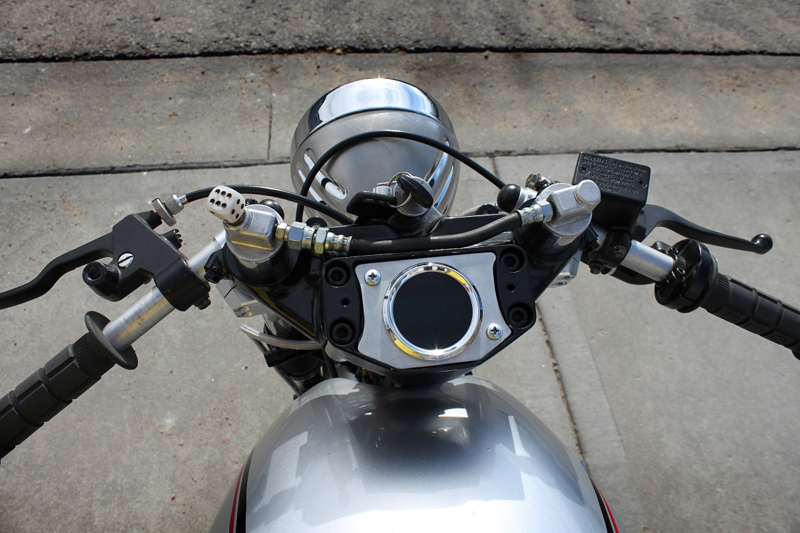 I mounted a custom digital speedometer where the fuse panel used to be (on top of the handlebar clamps). It is calibrated by a magnetic sensor that reads my rear sprocket as it turns. It has clip on handlebars made for a Ninja 500 and a motion pro throttle cable. 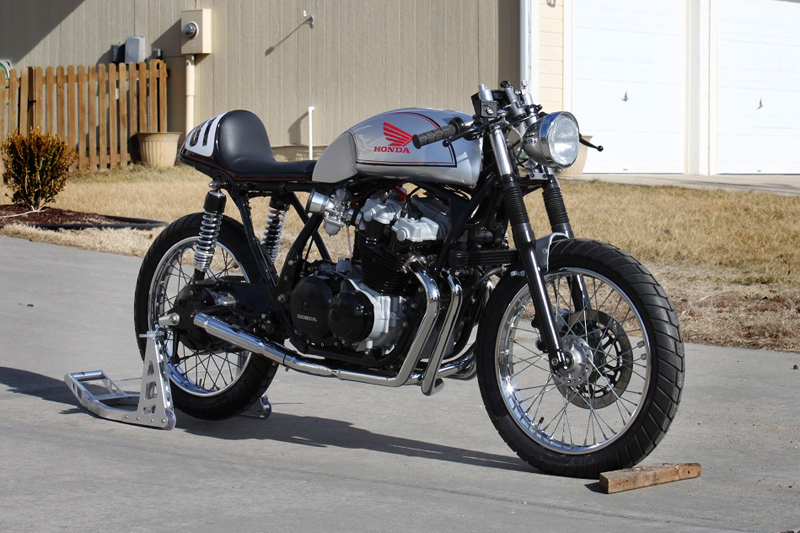 Lastly, the tank and seat were from Benjie’s Café Racer. They are both made of fiberglass. I sprayed the tank in Laurit silver, which is a sweet metallic silver found on the McLaren edition Merecedes-Benz. The rear tail section is gloss black. I was trying for a Norton Manx or Triton style paint scheme, so I layed some black and red pinstripes on it. The tail section has a painted on number panel with 81 because that is the year of the bike. The build itself took me over 2 years, I would work on it as I had the money to do so. My good friend Tony Stuckwiesch helped me assemble the motor, wire it up and do some welding. Other than that, I did all of the work myself on my back porch or in my garage. The day after I completed the bike, I took it to a large predominately Harley Davidson show where it won first place. I thought that was pretty funny. The lessons I’ve learned are ones that I try to adhere to in life. DONT RUSH IT! While speedy work is sometimes required, it can leave you saying “what if?” way too often. I take my time and try to do things right, even the little things. My dad taught me, “If a job is worth doing, it’s worth doing right”. Are you going to race the bike? I’d love to race the bike in a vintage class. Here in Kansas vintage classes (racetracks for that matter) are few and far between, but it would be really cool to take a road trip to a track day. Right now, I’m mainly just riding it on the weekends. I’m not going to kid myself……. another project! I’d really like to do a modern boardtracker type bike. You can probably see that I’m a “less is more” type of guy, so I think one of those would be right up my alley. You can be assured it will have a Japanese heart though.